In Signs of Resistance and Seeing the Invisible we emphasized two things well known to the interested, namely that most cancer deaths occur because cells spread from the original (primary) to secondary sites (metastases) where they are very difficult to treat, and that this places massive importance on early detection. Many will also be familiar with the currently used methods for tumor detection – X-ray based imaging (as in mammography and CT scans) and PET that detects injected radioactive tracers. The problem is that these are not sensitive enough to detect growths smaller than about 1 cm in diameter – and by that point there are several hundred million cells in the tumor and some may already have metastasized. Tumor cells spread around the body by detaching from the primary and getting into the circulatory system and it’s beginning to look as though quite literally tapping into the circulation may revolutionize cancer detection. Seeing the Invisible showed how silicon chip technology can be used to retrieve circulating tumor cells (CTCs) by getting them to stick to targets anchored in a flow cell. Although this is hugely promising, another very recent advance may be even more effective. This uses centrifugal force to separate cells in blood on the basis of their size – that’s the one that pushes outwards on objects rotating about an axis. Because force is proportional to mass and tumor cells are larger than red blood cells and most white cells, this effect can be used to extract CTCs from fluid being pumped around a spiral microchannel. The spirals are made from a silicon-based polymer (the same stuff that’s used for contact lenses) stuck on glass slides and they have two outlet channels. Their shape creates two-counter rotating vortices in the fluid that exert a drag force on the cells so that bigger (heavier) tumor cells can be selectively directed to one of the outlets. Typically red blood cells are about 6 microns (one-millionth of a metre), white cells 8-14 microns and CTCs 16-25 microns in diameter. The vortices are named after a Cambridge chappie, William Dean, who worked on flow patterns in curved pipes and channels and you can look up Dean vortices on the internet for images of these in action. 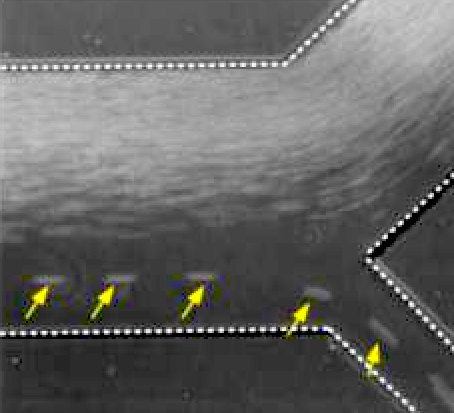 In this picture of the two exits from a spiral microchannel breast cancer cells are carried to the right (yellow arrows) whilst all the other types of blood cell funnel left. This method appears to be remarkably efficient in that over 90% of tumor cells (10-100 cells per ml of blood) can be separated from 99.99% of red cells (5,000,000 per ml) and 99.6% of white cells (10,000 per ml). Hou, H.W., Warkiani, M. E., Khoo, B.L., Li, Z.R., Soo, R.A., Tan, D.S.-W., Lim, W.-T., Bhagat, A.A.S., and Lim, C.T. (2013). Isolation and retrieval of circulating tumor cells using centrifugal forces. Scientific Reports 3, Article Number: 1259. DOI: 10.1038/srep01259.